As the earth turns . . . . Except for last minute baking, I’m ready for Christmas. Tree lights are glowing. Gift bags, stuffed with presents and labeled according to family groups, are neatly arranged around the tree. Our out-of-town family members’ gifts (to Colorado, Washington, and California) have arrived at their destinations. With approximately 46 family members, Christmas preparations are no small accomplishment. But, by God’s grace, I’ve managed to do it again. Online shopping and the plethora of available gift cards have made Christmas traditions incredibly easy. And it’s fun to shop throughout the year—finding gifts at art fairs, antique shops, and bookstores. Some of the items have been produced (painted, grown and dried, knitted, etc.) right here in our home. By December my storeroom is groaning with bounty, eagerly waiting to be wrapped or bagged. A sense of order reigns. While savoring the process of preparation, I focus on the Greatest Gift of all: our Lord Jesus Christ and the salvation He has provided through His shed blood, for all who will believe. God Incarnate died to pay our sin debt, and rose to give us Eternal Life. Through the Abundant Life of His Indwelling Holy Spirit, we have peace in the midst of turbulent times. As the earth turns . . . ! Now that may sound like a silly soap opera title. But the revolving of the earth around the sun, season after season and year after year, is far more exciting than any human meladrama ever imagined! The revolving of the earth is a God drama, and it never grows old. Some individuals are acutely sensitive to the turning of the earth and seasons, and I’m grateful to be one of those people. In our souls, we actually feel the turning which accompanies seasonal changes in the amount of daylight. The turning surges in our blood and bones, and we respond with anticipation and joy! Thus when we plummet headlong toward the darkest day (approximately December 21st this year), those of us who turn with the earth anticipate the very next thing—an increase in daylight which will begin shortly after the solstice. By Christmas Day, we’ll have gained one minute of daylight. According to my charts, New Year’s Day will bring an additional 4 minutes! The sun rises later for awhile after the solstice, but daylight compensates by increasing substantially at sunset. This after-solstice turning is illustrated by the above photo: a clean palette representing a new year. Recently I got up in the night, determined to make a fresh start at my bridge table studio. I really do believe in setting New Year’s goals, because (reasonable) goals inspire me to new adventures. My art goals for 2013 are: 1) slow down, deliberate more thoroughly, spend days (or possibly weeks) on a single painting and 2) work bigger. The sheet of ARCHES 140 lb. cold press paper pictured above is larger than I have successfully negotiated so far. I’ve tried working on a sheet this size, only to botch up part of it—resulting in cropping and matting smaller renderings from my initial attempt. Perhaps the goal of slowing down will facilitate a shift in the size of my “masterpieces”. A wise statement! Perhaps this will be the year when our nation returns to the premise on which we were founded. Perhaps 2013 will be the year when our Lord returns for his own! God is faithful and He will fulfill His plan as promised in Scripture, as the earth turns . . . ! *Praise God, I have a husband who heartily applauds my makey lifestyle. He has been apprised of my desire to paint big, and he’ll be interested in whatever is going on at his dinner table! I could set up an art camp in the middle of our living room, and he wouldn’t mind a bit. But he does have his very own room for lounging in a LAZY-BOY, resting on a daybed if desired, viewing whatever sports are in season, and working at his own paper-inundated computer desk. It comforts me to note that some geniuses (among them, reportedly, Albert Einstein!) have had messy desks like Joe’s. My desks are picky neat, so I’m obviously not very brilliant! But I never mess with Joe’s space, other than the occasional perfunctory swipe of the woolly duster on his TV screen and around the pictures (my art) on his walls. 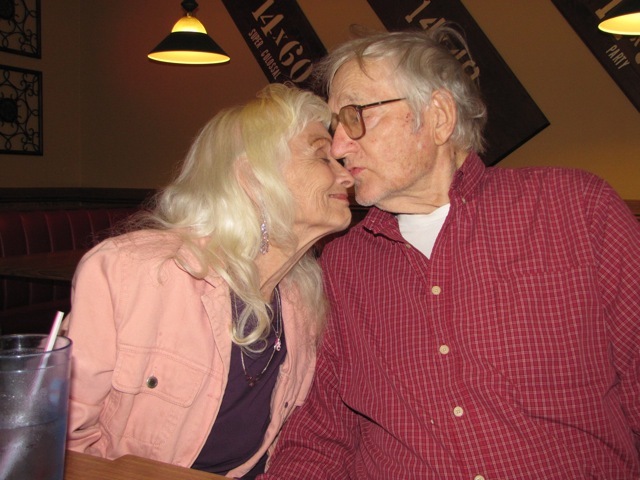 Today Joe and I are celebrating fifty-nine years of wonderful marriage. What a blessing, to look back over the years and smile—and to experience such amazing contentment NOW! 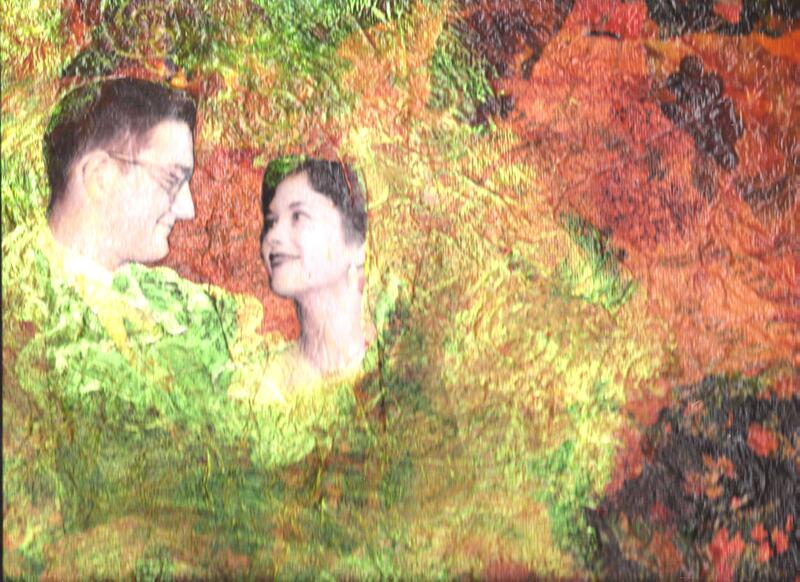 Pictured above is one of my hand made anniversary gifts to Joe: a mixed media collage with a photo of the two of us, taken at a ROTC Ball at UW-Madison in 1952. Typical of formal dances in those days, a big band played—I think it was Stan Kenton’s. Dancing was always big in our lives. Fantastic years—and a beloved family of six children, thirteen grandchildren, and sixteen great-grandchildren! Soon we may be renting a hall or park pavillion for family reunions. I know this sounds like bragging, and perhaps it is. But I give God the glory for keeping our love affair fresh and sweet, protecting our family, and navigating us during times of challenge—as well as throughout those many memorable decades of delight. God willing, Joe and I will celebrate by going out for breakfast and then strolling through a newly opened antique mall in Waukesha. Who knows what next? Maybe family visits, and certainly a time out for iced tea on our shady patio in the afternoon.